It’s not often a video story comes knocking at my door. A few weeks ago, Pat Adams, my next-door neighbor, came over to my house to ask me how she could get in contact with Dan Pelle, a co-worker of mine at The Spokesman-Review. Adams told me she had painted a picture of Pelle’s dog Koko, who died in a vicious pit bull attack last year, and wanted give the painting to him. 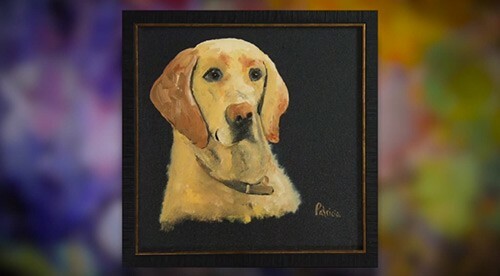 I learned Adams has been churning out dozens of oil paintings of people’s pets that have died, and that most of the painting recipients had never met her. When she told me she did the paintings free of charge, I knew I had a story. I start the story with a video title card with music. This short opener allows web viewers to adjust their audio. It also makes a great thumbnail for Vimeo, if that is where you upload to. I open the video with Adams painting at her kitchen saying: “I love to paint…” I use a camera slider to add movement in the first two shots. It gives the video a cinematic feel and helps reveal my subject for the first time. At 0.24 I introduce Adams with my opening narration. “For the past thirty years, artist Pat Adams has set up a painting easel and palette on her kitchen table…” Yes, I could have told this story without narration, but I don’t think the storytelling would have been as efficient. In this video, I only narrate in places where the story needs definition or a transition of time or place. When I started shooting with my Nikon D4 DSLR–a great low-light camera–I didn’t think I needed to light Adam’s kitchen. But the cool window light mixed with the warm incandescent light made it tough to get a clean white balance. Thankfully, I had a light kit at my house next door, and a few minutes later, I had two quartz halogen lights set up to bounce off the white kitchen ceiling. The white balance improved dramatically with the added warmer, softer light. Audio. I love using a wireless mic on subjects. The audio is clean and dynamically full compared to using just a shotgun mic. It has one other huge benefit—it allows the subject to be more natural without having a big microphone pointed at them from a foot away. I can be across the room shooting wide shots and still be getting wonderful soundbites to use later in the edit. Where the wireless mic paid off in this story is when Adams would talk to the painting. Those parts were emotional gold when I assembled this story later in Final Cut Pro X. In the first minute of the video, Adams reveals, as a young mother of a Down syndrome child, she had a small stroke. Her cardiologist told her she had to paint to relieve the stress. This is the first gold coin in the video. I don’t reveal the true direction of the story yet because I want to pull the viewer in and surprise them with the next revealing moment. At 1.06, I say: “Adams put her brush to canvas. At this point in the video I use a super-tight shot of her brush dabbing the canvas with paint. This is one of my favorite clips in the video. I shot it with a 60mm macro lens. It helps hold viewer interest in the story because I am showing them something they can’t normally see. The interview. I waited to do the interview until the second time I shot Adams painting. This allowed me to ask better questions. I kept a mental list to things Adams told me during the first shoot, which then helped me formulate better questions to ask her in the formal interview. The next big gold coin comes at 1.47. Adams says: “I think the first animal I painted was Sage…” This is where the first emotional tug in the story comes. It reveals what the story is really about, and hopefully, keeps the viewer engaged in where the story is going. At 2.15, I start showing some of Adam’s animal paintings. I used an out of focus photo of a painting palette as a colorful background. I use a drop shadow on the paintings to set them off a bit from the background. The one thing I kept telling myself as I shot Adams as she painted was to, “shoot wide, medium, tight, tight, tight.” The variety of the tight shots really made the editing job easier because I could use those shots as transitions between scenes. The next story gold coin comes at 3.07 when Adams says: “What’s the scariest thing in handing someone a painting”? I cut to Adams walking out of her kitchen with a dog painting and giving it to a young couple in the living room. Adams voice over continues to talk about her fear of rejection, but at the same time, the couple tells her they love and are amazed by her generous gift. This is where understanding the power of the edit—how you can weave different threads of narrative and have it all work together to advance the story–is so important. At 4.00 I take Adams out of the house and into her car to deliver the painting to Dan Pelle. 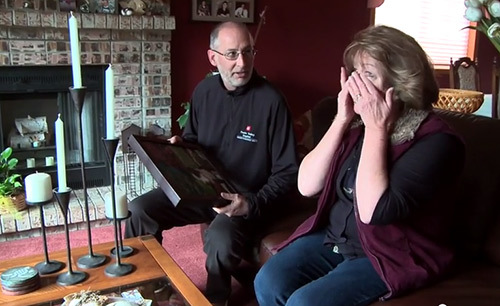 Other than knowing that she is bringing him a painting of his dog Koko, they had not met until he opens his door. I just told Dan I was going to be there and to just ignore me during their interaction. I shot some driving scenes on the way, and then a shot of Adam’s pulling into the driveway. This is where it starts to get technically messy. I switched to a traditional video camera for these scenes, because in run-and-gun situations, I find a DSLR is too slow to focus and make auto balance corrections on the fly. And because my video camera has two channels of audio (shotgun on the camera and a wireless on Adams) it gave me backup audio if one of the audio channels failed. My favorite edit comes as Adams exits her car and shuts the door. I straight cut directly to Pelle opening his front door and greeting Adams. In one simple edit, I cut a whole bunch of time out of getting Adams from her car to the front door. I think it works, but it is a bit jarring. At 4.30, Adams is invited into the house. It is technically challenging to go from outside daylight to inside incandescent mixed light. I put the camera into full-auto mode and hoped for the best. As I headed into the house, the camera was recording Adams and the Pelle’s as they introduced themselves. I can’t really shoot any cut-aways to cover the weird transition of white balance and exposure shift. Later, as I was editing this scene, I added a still photograph of the dog painting to cover of some of bad color shift. I always strive for perfection, but sometimes it just out of reach. The next gold coin is the interaction between Dan Pelle and Adams during the painting hand off. It is emotional (for her) and yet what Dan Pelle tells Adams is heartfelt. So how to get out of this story? Ira Glass, producer of “This American Life” says that a good story has to have a moment of reflection to remind the viewer why it was worth spending their time watching your story. As I was reviewing my footage, I came across this audio gem: “Its wonderful to see them. It’s like having your pet back home. Everyone needs a painting,” said Adams. I knew this clip was going to be my ender, my moment of reflection in the story. “Everyone needs a painting” has gotten a lot of positive feedback from viewers. “I’m bawling in front of my computer,” is one common comment on Facebook. Knowing that my edit instilled an emotional response, makes me feel confident I told a compelling story.